Stanford has two teams competing in its 2nd annual "The Goodwin" tournament where 25 teams will compete. 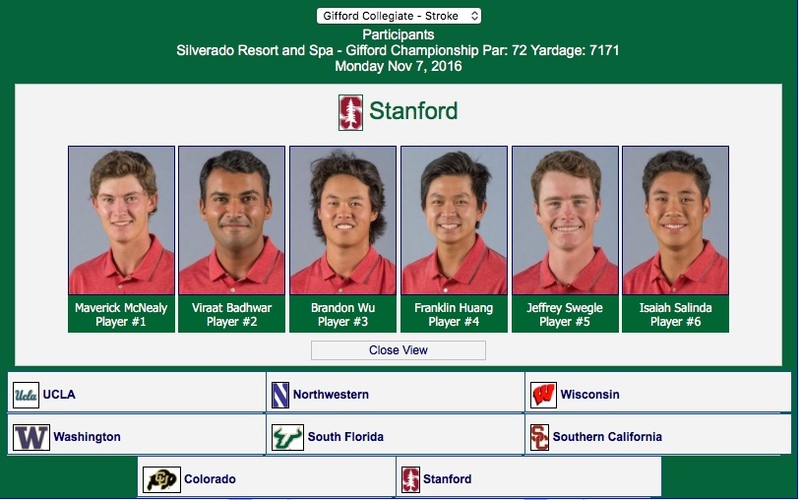 The Cardinal team A includes Maverick McNealy, David Boote, Brandon Wu, Viraat Badhwar and Bradley Knox. The Stanford White team B includes Jeffrey Swegle, Isaiah Salinda, Franklin Huang, Dominick Francks and Chris Meyers. Stanford finished third at its home tournament, The Goodwin, and placed six student-athletes in the top-20 Saturday at Stanford Golf Course. UC Davis’ Luke Vivolo was the tournament’s medalist with a 10-under 200. “Hats off to UC Davis on an impressive win,” Knowles Family Director of Men’s Golf Conrad Ray said. “They played really well with a lot of their guys knowledgeable of the course having grown up in the area. 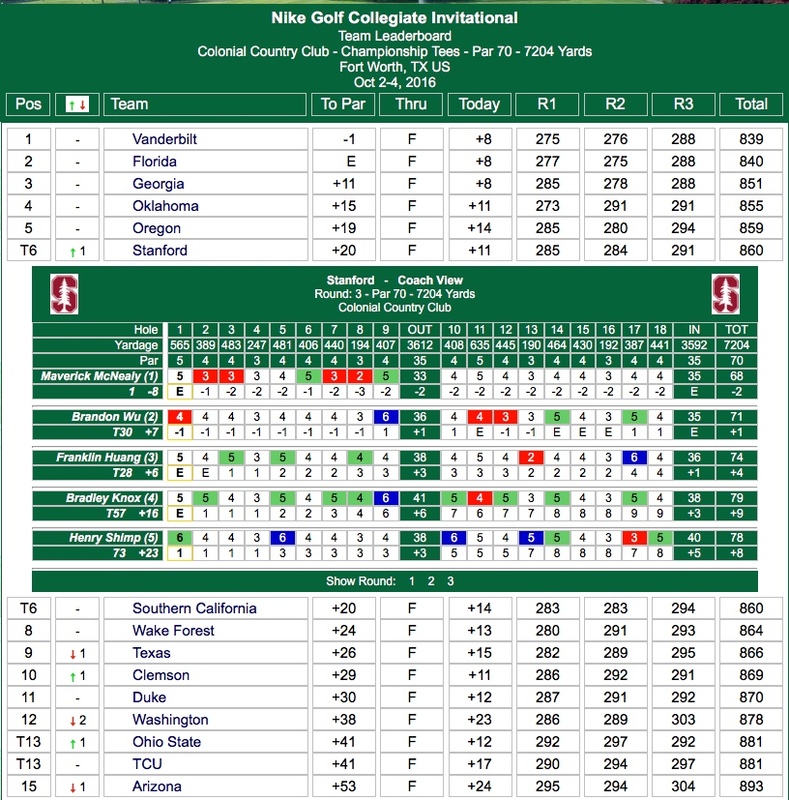 David Boote led Stanford with a fifth-place finish at 4-under, including an even-par final round. Boote had 72-64-70 206 T5 in his home finale as a Cardinal. Dominick Francks was a force to be reckoned with after rounds of 70-69-71 210 T10 to finish at even-par and tied for 10th with Brandon Wu (71-68-71 210 T10). 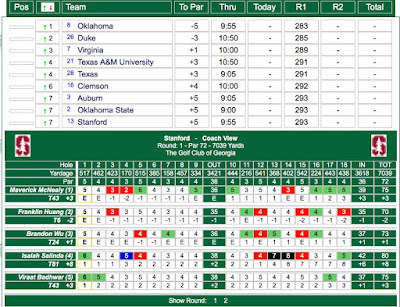 Checking in at 13th was Franklin Huang with tied for 13th (70-70-71 211 T13), four spots ahead of Jeffrey Swegle (70-69-73 212 T17) and Maverick McNealy (71-75-66 212 T17). 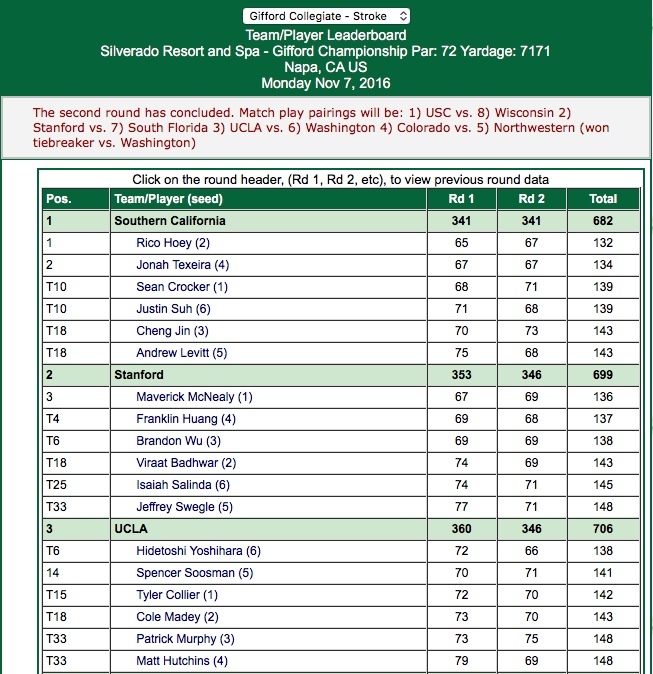 Swegle and McNealy were 2-over for the tournament. 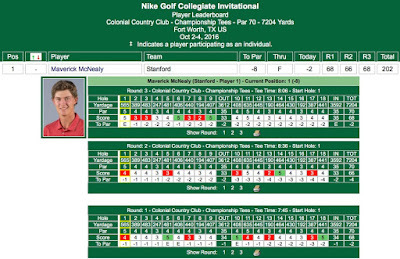 McNealy saved his best round for Saturday, connecting for five birdies and only one bogey during a stellar 4-under. Christopher Meyers (71-76-69 216 T41) moved up 30 spots to place 41st with a red score in his last circuit. Viraat Badhwar (70-74-73 217 T50) was 50th, Bradley Knox (68-73-78 219 T63) was 63rd and Isaiah Salinda (71-75-74 220 T70) was 70th. 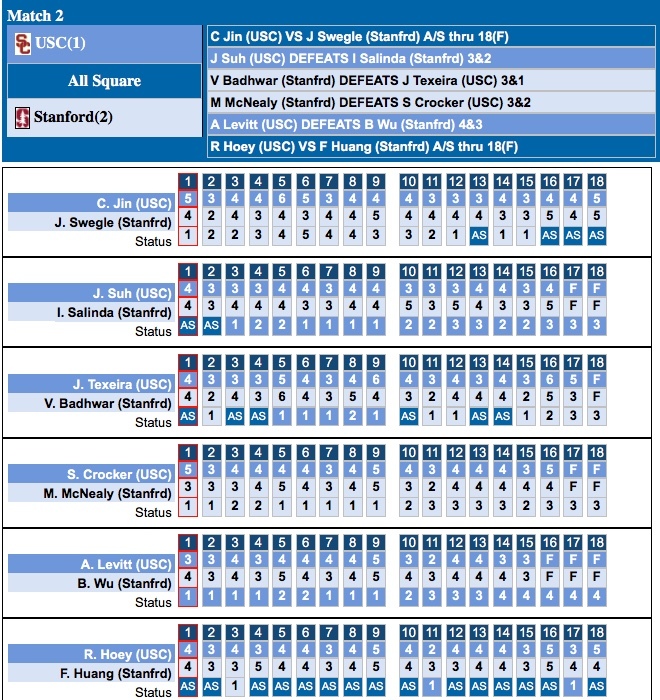 Stanford next will travel to the Western Intercollegiate (April 11-13) in Santa Cruz, California. David Boote was in the zone Friday during the second round of The Goodwin at Stanford Golf Course. The senior signed off on a 6-under 64, tying the 10th-best single round score in program history, to lead the Stanford men’s golf team heading into Sunday’s final round. Boote had six birdies and went without a bogey to post a score that was eight shots better than his opening round. He went from 42nd to move into a tie for sixth. Boote and the Cardinal are second among the 26-team field, aided by a 1-under 279. 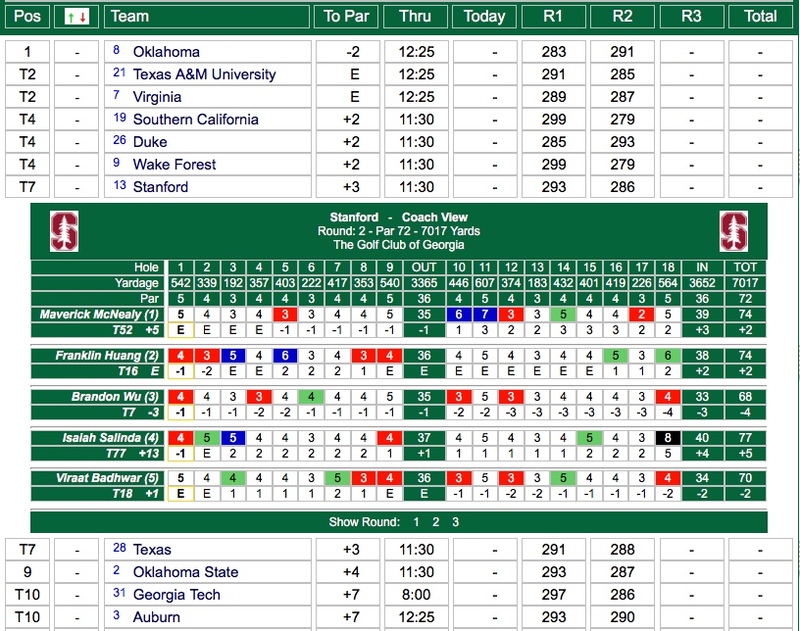 Stanford was one shot better than its opener, but currently 10 shots behind clubhouse leader UC Davis. 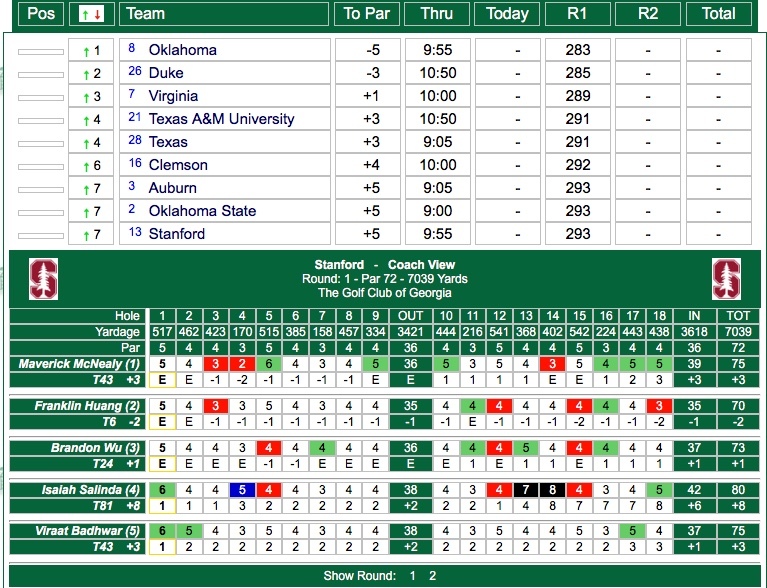 The Aggies went 8-under to move to 11-under overall. Colorado is third at even-par. 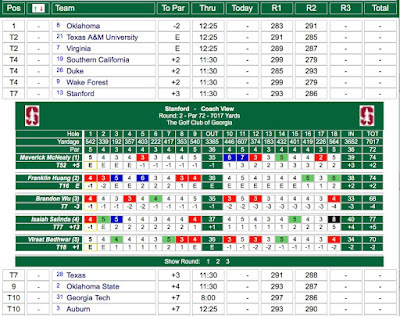 Brandon Wu, Dominick Francks and Jeffrey Swegle each are tied for 10th at 1-over through 36 holes. Francks went 1-under with four birdies and was 2-under on the front. Wu was 3-under on his back nine for a 68. Christopher Meyers, tied for 71st, checked in with a 76. Franklin Huang was steady with an even-par 70. Isaiah Salinda’s 75 put him in a tie for 62nd. Bradley Knox had five birdies while recording a 3-over 73. Viraat Badhwar is tied for 37th after his 4-over 74. Maverick McNealy was 5-over with only one birdie. 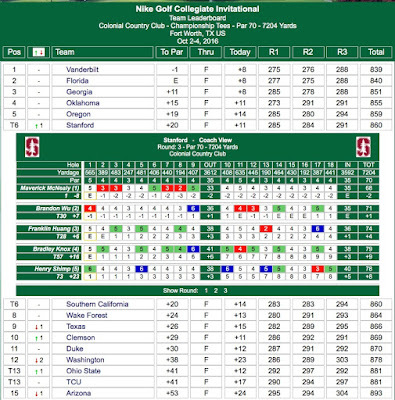 The Cardinal is tied for second (A team) and fourth (B Team) among the 26-team field through the first of three days at the event honoring legendary Stanford head coach Wally Goodwin. 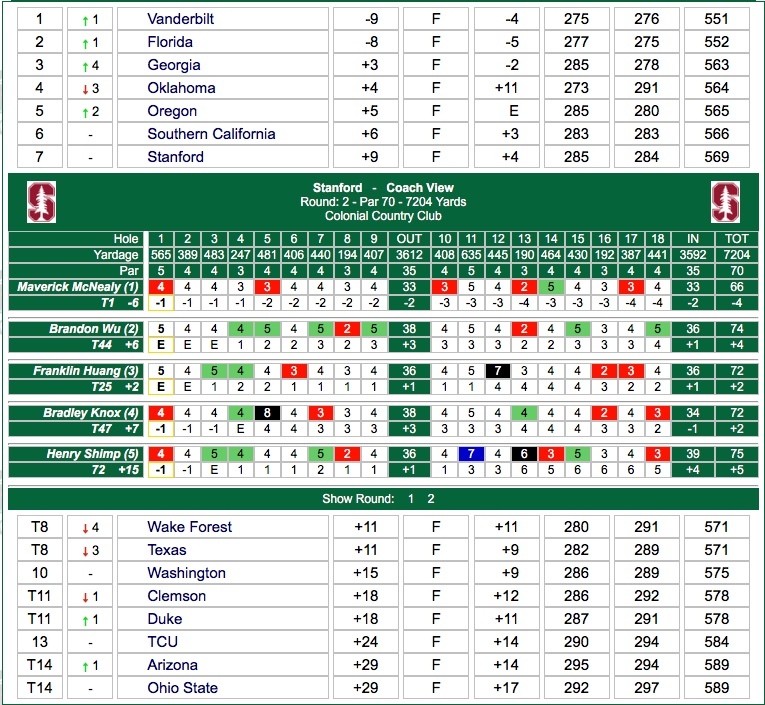 UC Davis leads the pack after a 3-under 277 on the par-70 track, led by individual leader Luke Vivolo’s 5-under 65. 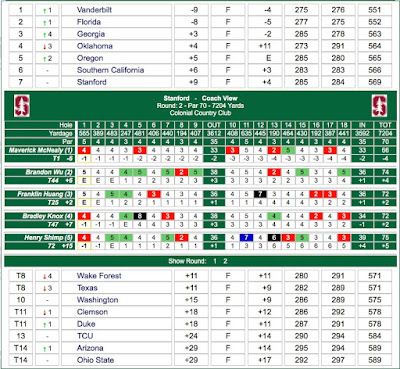 Stanford’s White unit fired a 1-over 281 with the Cardinal corps one shot clear with an even-par 280. Bradley Knox is tied for sixth at 2-under. He was 2-over through four and chipped away with four birdies while playing bogey-free golf the rest of the way. Viraat Badhwar, tied for 19th, eagled the opening hole and battled through for an even-par 70. 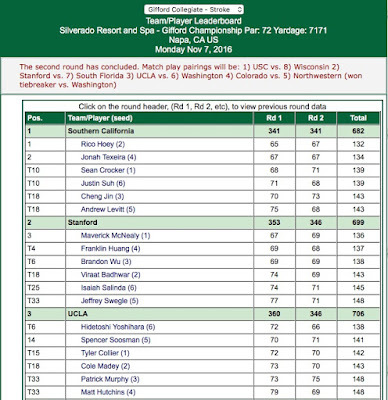 Maverick McNealy and Brandon Wu each are tied for 28th at 1-over. David Boote had three birdies during a 2-over circuit. Jeffrey Swegle, Franklin Huang and Dominick Francks are knotted in 19th after even-par rounds. Christopher Myers and Isaiah Salinda were 1-over. Swegle eagled the par-5 first and Francks did the same on the par-5 seventh. • Stanford will play host to The Goodwin (March 24-26) at Stanford Golf Course. 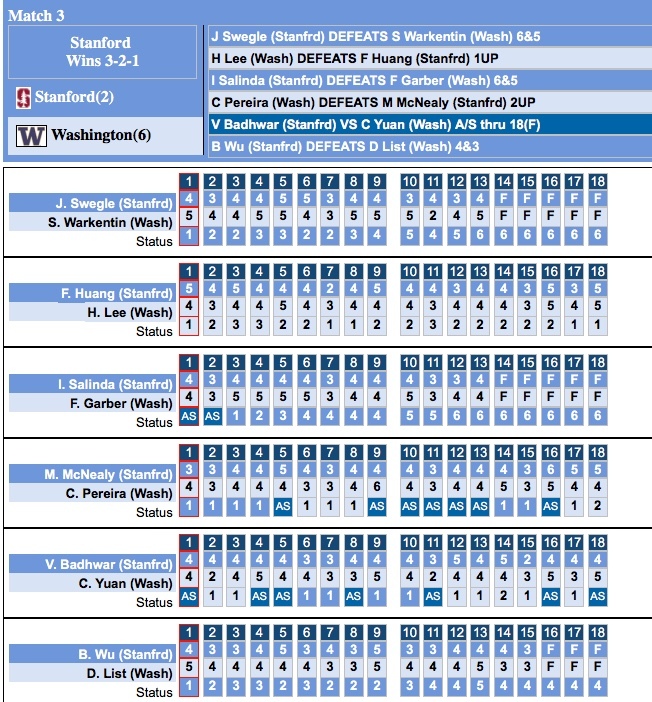 • Goodwin recruited and coached standouts such as Tiger Woods, Casey Martin, Notah Begay, Joel Kribel and current Stanford head coach Conrad Ray, among many other stars from Stanford’s proud golfing tradition. 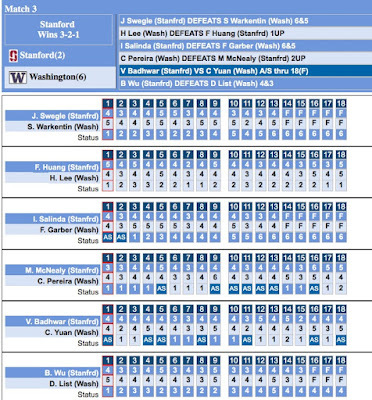 • Stanford has claimed 14 team victories and 15 individual titles at the event, the most of any program in each category. The Cardinal captured the first team and individual titles in 1968 during the inaugural year of the tournament. 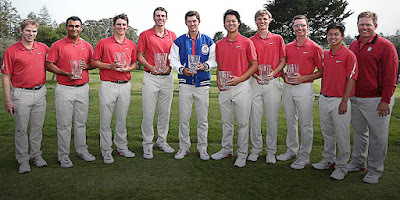 • Stanford alumni who have won the event include Sandy Adelman (1968), Gary Vanier (1970), Tom Watson (1971), Conrad Nilmeier (1973), Dave Baskins (1974), Mike Peck (1976), Mike Milliken (1990), Casey Martin (1995), Joel Kribel (1996-97), Philip Rowe (2002), Rob Grube (2006-07), Patrick Rodgers (2014) and Maverick McNealy (2015). • The Cardinal holds the event’s longest team winning streak at six (1970-1975). • The 25-team field is comprised of No. 4 USC, No. 10 Stanford, No. 17 North Carolina, Arizona, BYU, Colorado, Colorado State, Denver, Fresno State, Loyola Marymount, Marquette, Nevada, Northern Colorado, Northwestern, Oregon, Pacific, Pepperdine, St. Mary’s, San Jose State, Santa Clara, Southern Methodist, UC Davis, UCLA, UNLV and USF. • The field includes Stanford’s Maverick McNealy, who won the 2015 event with a 13-under 197. • The par-70 course will play at 6,727 yards for The Goodwin. • Designed in 1930 by renowned architects William Bell and George Thomas, the course is steeped in tradition. 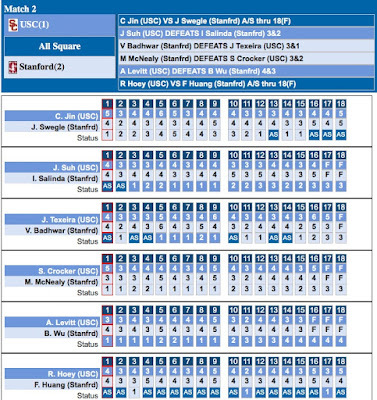 Throughout the years, Stanford has hosted many intercollegiate and non-collegiate events, including the Stanford Intercollegiate, Peg Barnard Intercollegiate, Pac-10 Championships, NCAA Regional Championships, NCAA Women's Championship, USGA Junior Amateur Qualifying, U.S. Open Qualifying and The Gathering at the Farm, a former Senior PGA Tour event.